GAME FIVE PARTIAL TV BROADCAST! For the first time ever, the actual Partial TV Broadcast of a vintage World Series game with original TV commercials can now be see again on DVD, thanks to the film restoration expertise of Rare Sportsfilms! This DVD is an absolute MUST for all Dodger fans, as 1955 will always be remembered as the year Brooklyn finally won its only World Championship (after 7 previous tries)! At gametime, the 1955 World Series is tied at 2 games apiece as Dodger rookie Roger Craig makes his first W.S. start against Bob Grim of the Yankees at old Ebbets Field, Brooklyn! “Be there” in front of your old B & W TV set again 50 year later, as the National Anthem is played and this crucial and historic game begins! You’ll see the first three full innings of action as famed Yankee broadcaster Mel Allen does the play by play! Later, you’ll hear Dodger voice Vin Scully call parts of innings 5, 6 and 7! There’s plenty of action! You’ll see double plays, a fabulous catch by Irv Noren, four home runs are hit and Dodger slugger Duke Snider ties his own World Series record of 4 HR’s in one series – with at least two games still to play! This 1½ hour DVD brings back all the memories of those early televised World Series games and New York baseball as it was played over half a century ago! Live TV broadcasts from before 1965 are very rare. 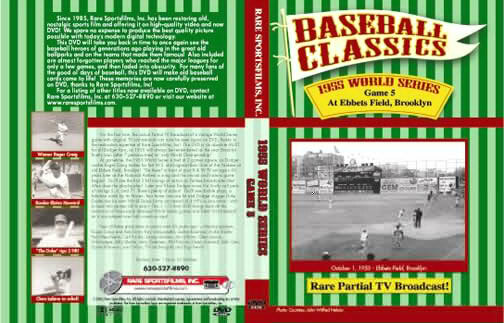 Only a very few complete baseball game TV broadcasts from pre-1965 are known to exist and all are World Series games. The two oldest are stored in the Museum of Broadcasting in NYC. The others are in our private collection! Because each complete game required at least five reels of kinescope film, the reels were easily lost and scattered, so when a TV broadcast did show up, it was always one or two reels (an inning or two) at best. But what a treat nowadays to be able to see most of this game from the 1955 World Series!